The Nintendo Switch released in March, 2017, so it’s still a new console and I’m eagerly waiting for more triple-A games to release for it. With that said, the Switch library is still in its infancy. Digital titles have been filling up the vacant Switch eShop, many of them are Neo-Geo or indie games. One of those titles recently caught my eye. 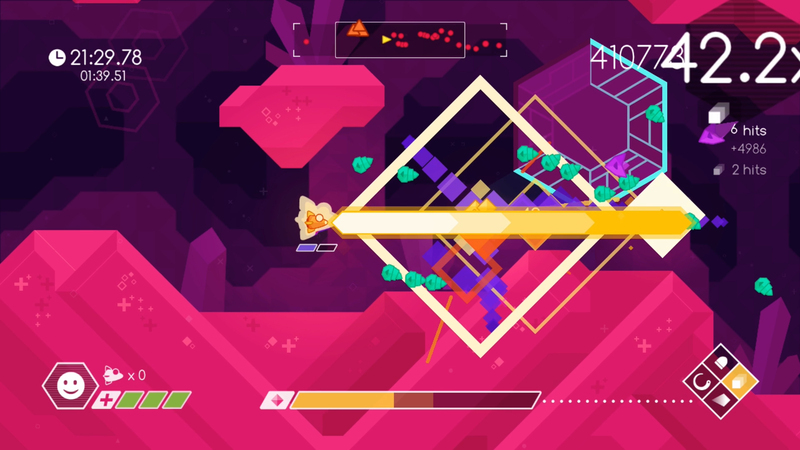 Developed and published by Vertex Pop Inc., Graceful Explosion Machine is a shmup of sorts, released in April, 2017. It’s an arcade style shooter that one may compare to the original Defender, however they’re really not all that similar. With it’s simplistic visual style, fast-paced gameplay, and intense action, Graceful Explosion Machine can provide some addicting fun for fans of the shmup genre. I think this game has a story. When you start playing, the game opens with images that look like they were created in Flash. You need to press a button to proceed to the next image and it’s up to you to piece things together. After beating the game, once again you’re presented with images. I didn’t know what the hell was going on but I don’t think it matters anyway. Thanks to the internet, I was able to obtain some information, even if it is minimal. All I know is you pilot the GEM fighter, a fighter ship with an array of overpowered weapons. You start each level with two lives and three hit points. If you lose all of your hit points and get hit again, you die and lose a life. Lose all of your lives, and you’ll need to restart the level. Health can be acquired by picking up Life Savers, dropped from destroyed enemies and each Life Saver rewards you with one hit point. Each planet consists of several levels and has a different theme, differentiated by color. No matter which direction you fly, the levels loop so it feels like the levels have no beginning or end. Some levels are more confined with clear walls that you can’t fly past, adding more challenge since you’re now in a much more confined space with swarms of enemies to deal with. Even with different color schemes and slightly different backgrounds, the levels don’t really change much so they all end up feeling the same. You’ll navigate through four planets, with nine levels each, blowing away thousands of enemies in an effort to achieve a high score. Each level, minus the final one, within a planet requires you to kill all of the enemies across three phases. In the final levels, within each planet, you need to kill all of the enemies to unlock and retrieve the Warp Crystals. You must unlock later planets and levels by completing earlier ones and after completing all of the levels within a planet, you unlock Challenge Modes for that planet. The Challenge Modes include a Warp+ level and a Score Attack which consist of you beating every level of a planet in succession with only one life. Your hit points do carry over to each level in this mode so you need to be extra careful. The gameplay is pretty straightforward. You fly left and right and can flip your ship to face in either direction at any time. You have a dash move that lets your ship quickly dash through enemies and is a great way to save yourself if you get swarmed. However, it doesn’t save you from enemy bullets. You can only dash twice and then one of the two dash bars will need to recharge before you can dash again. Dashing is crucial for survival, especially late in the game. The first two levels of the first planet teach you everything you need to know and then you’re on your own. You’ll always have four weapons at your disposable and each of them have stats that vary in range, power usage, and damage. Range and damage are obvious but power usage is the one you should really care about. Three out of the four weapons use up power and when the power meter is drained you either need to wait for it to refill or kill enemies to retrieve crystals which will refill the power meter upon pickup. The Blaster is your standard mid-range weapon and while it doesn’t use power, it can overheat. The Energy Sword is a your close-range, 360 degree attack weapon which can also destroy enemy bullets. The Sniper Beam is your long-range weapon and causes extra damage when focused on a single enemy. The Missiles are great for taking out large groups of enemies quickly and you can guide them in any direction. Every weapon is useful and satisfying. Knowing what weapons to use and when is critical and with “Tips” turned on, the game will tell you when it’s best to use specific weapons. But you can easily figure it out. The bullet sponge enemies are easily taken out by the Sniper Beam while the smaller and faster enemies can be dealt with quickly by a barrage of missiles. Bullets coming at you in every direction? Well get ready to use your Energy Sword. This is also a great weapon to use if you get swarmed. While Graceful Explosion Machine may lack in the narrative department, it more than makes up for it with its gameplay. The gameplay is fast, to-the-point, and most of all, fun. I beat the thirty plus levels over the course of two days and found it hard to stop playing. All enemies explode, and due to the game’s simple, geometric visuals, the explosions are shaped like diamonds so be prepared to see them in your sleep. But what gives this game replay value is the scoring system. It’s all about the multiplier so killing enemies in succession increases your multiplier for more points. You’ll want to chain kills together quickly and keep it going for the entirety of each phase. Each phase gets more difficult and you must master the game’s mechanics to survive. As you kill enemies, more and more will spawn in until you’ve managed to destroy them all. Exclamation points appear where enemies will spawn and they usually spawn in groups. If you manage to complete a level you’re scored based on style, hits taken, and time so you’ll want to be quick and efficient. 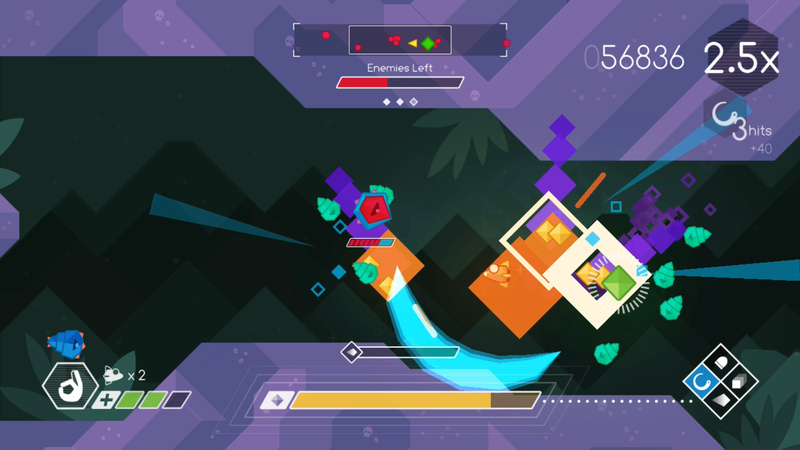 Graceful Explosion Machine may look simple, and you may even think it’s easy to beat, but it will make you earn that high score. Your scores for each level can be posted to the leaderboards. 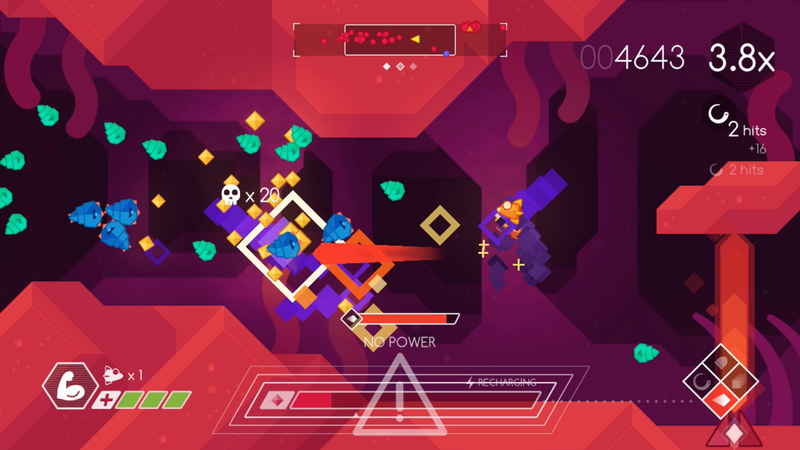 Compared to traditional shmups, Graceful Explosion Machine is a bit on the easy side. That is if you’re talking about just beating every level. I still died several times but I was able to complete it. 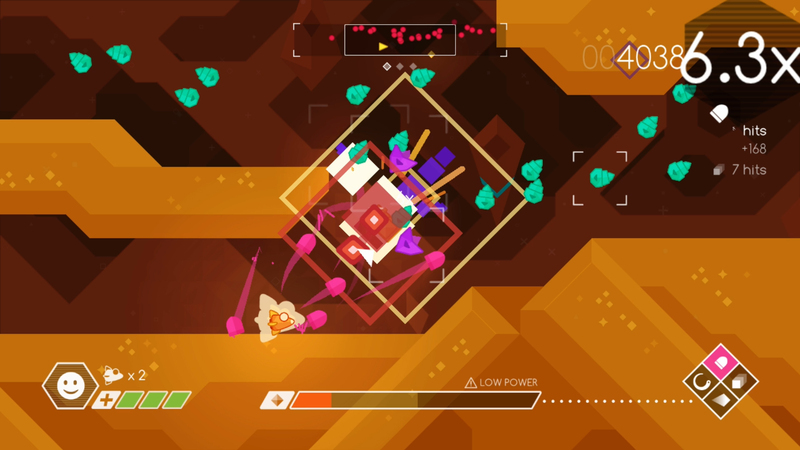 I mentioned earlier that Graceful Explosion Machine could be compared to Defender and by that I mean only on the surface. Flying left and right in a looping area and killing enemies are the only things they share in common. You’re not rescuing people in Graceful Explosion Machine and it’s not nearly as difficult as Defender. The enemies mostly consist of little green and slightly bigger blue enemy types. As you progress through the game, tougher enemies are introduced and will reappear often but not as often as the green and blue enemies. Some enemies fire bullets, there’s a couple of snake-type enemies, and my least favorites are the ones that explode into smaller ones. Enemies will always come for you if you’re in plain sight and if you’re not they will slowly gravitate towards your way so you can’t really remain in one spot for too long. My only gripe with the game is that I wish there was more. The Challenge Modes and scoring system will indeed keep dedicated players coming back but for the more casual crowd, once you’ve completed the first or second planet, you’ve pretty much seen it all. The game can easily be beaten in a day and there’s no boss battles of any kind. That really kind of bummed me out. I think boss levels would be a great addition and possibly add more challenge to the otherwise easy game. Some of the levels can feel confined and I think a large, shape shifting boss, that can maybe be broken up into pieces, literally from your arsenal, would add some unique challenges and really test your skills. But alas, this is not the case. There’s also no difficulty modes. I think that’s a big missed opportunity as it would increase the replay value even more. From what I understand, this is a timed exclusive for the Switch and maybe updates or even other versions will contain more content. That’s something I would love to see. I think the developers really have something here. 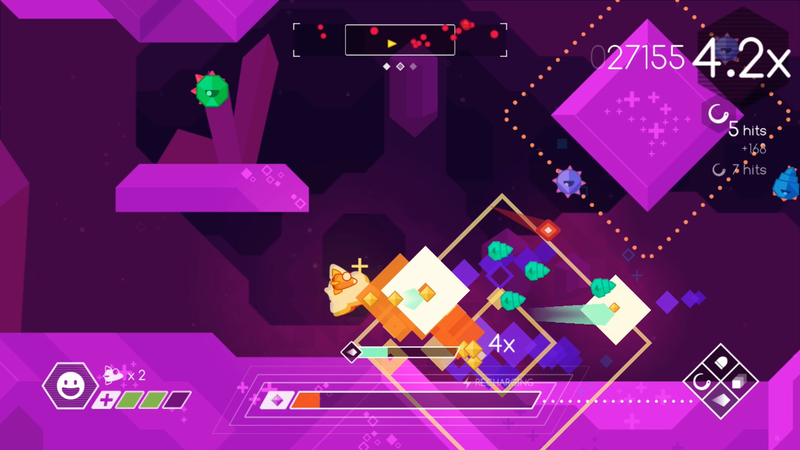 Graceful Explosion Machine is a very simplistic game, visually. The geometric shapes and vibrant colors give the game a very simple and soothing appearance. It’s very easy on the eyes and it’s pleasing to look at. The visual style works well and nothing about it begs for any fancy effects. The synthesized music is equally as soothing, although I didn’t find it as memorable. Most of the songs are catchy but I just found it very easy to drown out the music. Overall, the entire presentation is pleasant and relaxing. I played this on both the TV and tablet and it ran super smooth without any slowdown or bugs. 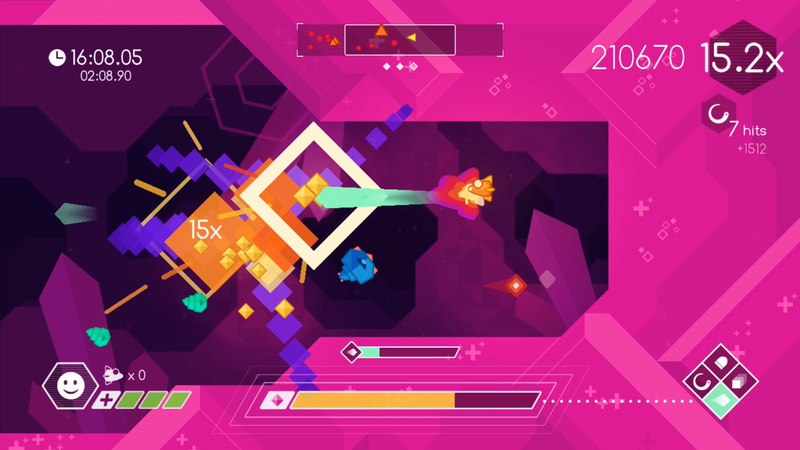 Ultimately, Graceful Explosion Machine is an excellent game. Considering it’s only $12.99 right now on the Switch eShop, I would recommend this to anybody. It lacks a bit in content but makes up for it with addicting fast-paced gameplay. It’s one of those games that’s easy to get into but hard to master. The controls work well, the game runs fine, and the simplistic visual style gives it a somewhat unique feel. Sure, all of the levels kind of feel the same but the gameplay is addicting and it gradually becomes more challenging as you progress. Going for a better high score is the real meat of the replay value. I’m really hoping there’s a future for Graceful Explosion Machine, whether it be more content or sequels, and I would say this is an absolute must-play for any Switch owners.